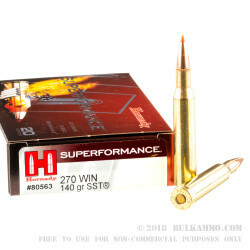 A medium game super round, the .270 Winchester load from Hornady in 140 grains with the SST projectile is an excellent round where hunters need moderate velocity, high accuracy and heavy wound channel. The jacketed projectile offers a consistent mushrooming effect and the capability of creating larger wound channels through a shard shedding effect. The polymer tip forces a controlled expansion and allows for a larger channel at impact. 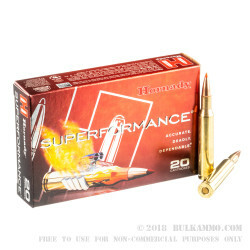 This particular bullet engineering utilizes a traditional boattail base design and adds next level technology that has helped to build the Hornady name as a progressive innovator in the projectile/ammunition sector. SST stands for “Super Shock Tip” which produces a ton of impact and a large channel dumping a lot of energy into the animal with moderate penetration. The new manufacture brass casing and low foul propellent combines for an easy all around hunting load, that can punch above its weight class. With capabilities of taking out a vast range of animals from 50 lbs. to 1500 lbs., this load is an extreme performer with a modern meets traditional design. 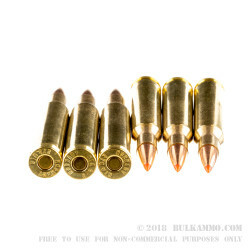 It can achieve consistent velocities of 3090 feet per second at muzzle exit and 2968 ft. lbs of energy at the muzzle which makes this 140 grain load a versatile and lethal hunting round for those who prefer the .270 platform for anything from small game to large game. 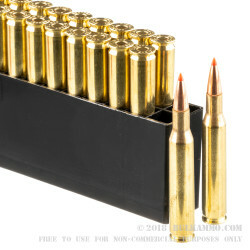 Packaged in 20 round box with a plastic insert, this cartridge is boxer primed an brass cased, and features a jacketed partial antimony projectile. Suitable for use in rifles marked: “.243” and “.243 Winchester”.